1. 5-pound shrimp, cooked, peeled, deveined, cut into 1/2 inch pieces. 1. Place the shrimp and celery in a mixing container, toss gently. 2. Squeeze the lemon juice over the shrimp-celery mixture, add the mayonnaise and toss gently a second time. 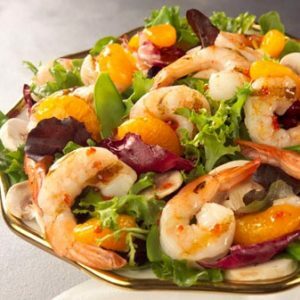 Shrimp salad is most popular when served as an entree or main course salad It is served in a large salad bowl (or on a inch plate); the serving portion is increased and it is garnished with hard boiled egg quarters and tomato slices or wedges. Shrimp salad is also served as a filling in stuffed tomato salads. Always serve a slice or wedge of lemon with seafood.